Jypyä Pop (Turku, Finland) on 15 May 2017 in Lifestyle & Culture and Portfolio. In the spring on maternity day, motorcycle enthusiasts will gather to devote themselves to the devotion and ask for a blessing for the coming summer. Thousands of enthusiasts participate in the event, and for this reason they will have to restrict traffic so that the walkway can safely move to the party venue. Haaa oui une très belle sortie pour ces motards ! I like the perspective here, with the hill. One gets the impression that the line of bikes goes on forever. Thank you for the explanation ! A grand point of view! What a beautiful parade of motorists! Superb capture of the event ! A biker invasion! Neat shot of the riders. Must be quite a spectacle! Impressionnant ! J'imagine le bruit ! 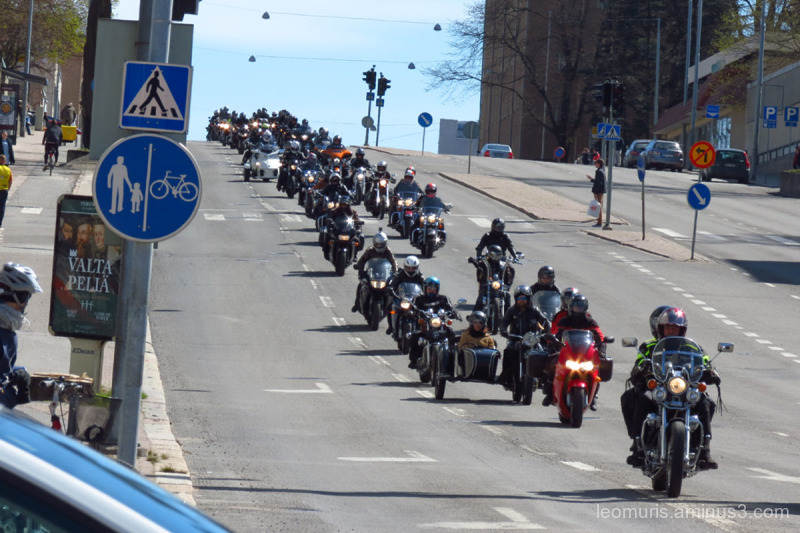 @Steven: In Finland, motorcyclists are middle-aged and families. Motorcycles are large and expensive and such events are well controlled. This is as smoothly as possible when there are about 2,000 motorists on the road.